My mom and dad told me that when I was little, they used to pick their battles with me. It is not smart to argue about small things. I think the same advice could be used with an Alzheimer's patient. The last time I visited grandma, she REFUSED to wear her winter coat. It was really chilly outside. (38 F) I solved the problem by using Grandma's coat as a blanket. 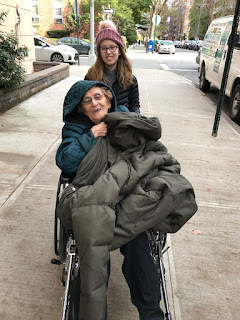 It still kept her warm, and we were still able to take her outside! 1. Think of a different way to solve the problem. 2. Try to find out WHY your family member does not want to do something. In our case, Grandma was in pain. She had shingles a year and a half ago, and still has nerve pain, on and off. Wearing a coat on her back sometimes hurts her. She did not tell us about the pain, but we figured it out. Remember, your loved one, cannot always tell you what is wrong, you need to figure it out. 3. If your loved one is not in danger, give in. One time, grandma wanted to wear her nightgown outside in the summer. She thought it was a pretty dress. We let her do it. It was warm outside, her body was covered, and she was safe. Who cares if it looked SILLY, grandma was happy!